BACKGROUND: A needlestick injury is an accidental skin-penetrating stab wound from a hollow-bore needle containing another person's blood or body fluid, leading to infection of diseases transmitted by blood such as hepatitis B virus, hepatitis C virus, and human immunodeficiency virus. The purpose of this study is to assess the level of knowledge and practice of needlesticks injury prevention measures and to estimate the incidence of exposure to needlestick injury among nurses working in the governmental hospitals in Sana'a city, Yemen. MATERIALS AND METHODS: A cross-sectional study among a random sample of nurses (n = 259) were conducted. A pretested structured self-administered questionnaire was used for data collection. Data were analyzed using IBM SPSS Statistics for Windows, Version 20.0. (Armonk, NY: IBM Corp). RESULTS: One hundred and fourteen (44%) respondents had poor knowledge of needlestick injury preventive measures, 75 (29%) had a fair knowledge, and 70 (27%) had good knowledge. The knowledge was significantly associated with hospital's name (P < 0.017). One hundred and ninety-eight (76.5%) respondents had a poor practice of needlestick injury preventive measures, (8.9%) had fair practice, and (14.7%) good practice. There was a statistically significant association (P < 0.001) between the knowledge and practice. Among all the respondents, 48.6% were vaccinated against hepatitis B. CONCLUSION: The practices and knowledge of needlestick injury preventive measures were low and occupational exposure to needlestick injury was a common occurrence in the study sample. This needs intensive programs to educate nurses on various aspects of needlestick injury preventive measures. Vicharchika (Eczema) is a type of kshudrakustha often encountered by Ayurvedic Dermatologists characterized with symptoms, namely, kandu (itching), srava (discharge), Pidaka (vesicles), and Shyava varna (discoloration). Vicharchika is often correlated to eczema based on the clinical presentations. No satisfactory treatment is available in contemporary medical practice except antihistamines and topical steroids. Main line of treatment for vicharchika in Ayurveda is Shodhana and shaman oushadhis. A patient approached to outpatient department with chief complaints of discharge, edema, and erythematous skin lesions with intense itching at the ankles and dorsum of both foot, dorsal aspect of the hands, and on cheeks was treated with Virechana and few Agada preparations. A remarkable improvement in the condition was observed in a span of 2 months. BACKGROUND AND OBJECTIVES: Awareness of gestational diabetes mellitus (GDM) among pregnant women is poor. However, increasing awareness may help in diagnosis and prevention of maternal and fetal complications. Hence, this study was aimed at evaluating the knowledge in diagnosed GDM pregnant women. METHODOLOGY: This cross-sectional study was conducted from October 2014 to March 2017. A total of 500 registered pregnant women diagnosed to have GDM residing within 5 km of the study area aged more than 18 years who were willing to participate in the study were enrolled in the study. The participants were provided with the questionnaire which was designed to assess their knowledge about GDM. RESULTS: The age of the women ranged from 22 to 44 years with mean age as 27.53 ± 2.42 years and median age as 27 years. The most common age group was 26–30 years which comprised 67.6% of the women. Maximum women had primary education (61%) and were Hindus (54.8%). Most of the women were working (54.8%), resided in slum areas (43.2%), and had body mass index (BMI) between 19.8 and 26 kg/m2 (67%). The mean BMI level was 28.07 ± 4.11 kg/m2. The mean blood sugar levels at diagnosis ranged between 88 and 300 mg/dL and the mean blood sugar level was 201.36 ± 38.67 mg/dL and the median blood sugar level was 190 mg/dL. Majority of the women, that is, 57.6% of the women, had an average knowledge about GDM while 21.8% of the women had good knowledge, 1.6% had excellent, and 19% had poor knowledge. The mean knowledge score was 6.51 ± 3.41. The mean percentage of the knowledge was 36.14% ± 18.94%. Statistically significant association was noted between knowledge about GDM with maternal age and educational status, religion, and occupation (P < 0.050), but the GDM knowledge was independent of that found between place of residence (P = 0.715) and family history of DM (P = 0.661). CONCLUSION: There is poor knowledge about GDM in the study area. Hence, there is need to create awareness of this condition through counseling and use of mass media. Malignant melanoma is the most aggressive form of skin cancer, with a high mortality rate. The current chemotherapies have a relatively low success rate due to the development of multidrug resistance and side effects. Hence, there is need of discovering new compounds that are safe and more effective against melanoma to improve the efficiency and to lower the treatment cost for cancer care. Melanoma chemoprevention with natural herbal phytoconstituents is an emerging strategy to prevent, cure, or treat melanoma. This review summarizes the latest research in melanoma chemoprevention and treatment using the herbal phytoconstituents. Relevant mechanisms involved in the pharmacological effects of these phytochemical are discussed. Phytoconstituents that are discussed in this review are carotenoids, flavonoids, some polyphenols, piperine alkaloid, and sulforaphane having high anticancer potential mostly to be used for the treatment of melanoma. INTRODUCTION: Fruits are very good sources of micronutrients. In the present era, eating fruits is questionable due to hazardous effects of artificial ripener usage on fruits. Ascorbic acid (C6H8O6), a major antioxidant water-soluble vitamin, acts as a reducing agent for many metabolic reactions as a coenzyme. Since it is heat-labile, fruits remain as a prime source as they are eaten uncooked. Mangoes, Banana, and Papaya are the most commonly subjected fruits for artificial ripening. However, artificial ripeners such as ethephon and calcium carbide have antinutritional and hazardous effects on health. This study analyzed the effect of the second most commonly used artificial ripener ethephon on mangoes in comparing with naturally ripened mangoes. STUDY PURPOSE: To fulfill the increasing fruit demand and for commercialization fastening of fruit ripening is done. The aim of the present study is to assess whether artificial ripening will affect the Vitamin “C” level in mangoes or no. OBJECTIVES: Compare the Vitamin C levels in artificially ripened with naturally ripened mangoes. METHODS: Vitamin C was analyzed using simple UV spectrophotometric method using 2,4-dinitrophenylhydrazine reagent. RESULTS: The results of the present study showed that the naturally ripened mangoes had a mean of 7.6 ± 6 mg/100 g more of Vitamin “C” than artificially ripened mangoes. CONCLUSION: The Study concludes that the Vitamin C contents is more in naturally ripened mangoes than the artificially ripened mangoes with using 1000 ppm of ehtephon. BACKGROUND: According to the World Health Organization (1981), natural menopause is defined as no menses for 12 consecutive months with no obvious intervening cause. During the menopause, women may experience vasomotor, psychosocial, physical, as well as sexual dysfunction. Studies on menopausal issues and health demand priority in Indian scenario due to the growing population of menopausal women as a result of their increased life expectancy. OBJECTIVE: To know the prevalence of menopausal symptoms in the postmenopausal women aged 40–60 years. METHODOLOGY: A community-based cross-sectional study was conducted between January 1, 2016, and December 31, 2016, using a predesigned, pretested, structured questionnaire based on sociodemographic variables and menopausal symptoms as per the menopause-specific quality of life questionnaire. A total of 345 postmenopausal women aged 40–60 years residing in the field practice area of Urban Health Centre, Ashok Nagar, Belagavi, were selected by systematic random sampling technique and interviewed during house-to-house visit. The outcomes of this study were menopausal symptoms in the postmenopausal women. Data collected in the questionnaire were coded and entered in Microsoft Excel sheet. Values were expressed in the form of frequency and percentages. Tables were prepared. Statistical significance was set at P ≤ 0.05. RESULTS: In this study, the mean age among study participants was 52.04 ± 5.58 years. Majority 200 (58%) were Hindus, while 266 (77.1%) were literates. The most common menopausal symptoms were of physical domain (75.7%–25.5%), followed by psychosocial domain (63.9%–49.3%) to vasomotor domain (63.5%–55.4%) and least common sexual domain (42.3%–36.2%). BACKGROUND: Ovarian cancers represent the 4th most frequent type of cancers among females and are the most common cause of death from gynecological cancers in the world. AIMS AND OBJECTIVES: The aim is to evaluate the expression of estrogen receptor (ER), progesterone receptor (PR), and human epidermal growth factor receptor (HER2/neu) immunohistochemical markers in surface epithelial ovarian tumors and its clinicopathological correlation with CA-125 level, histological type, grading of tumors, and prognosis of ovarian tumors. MATERIALS AND METHODS: This study included 48 cases of surface epithelial ovarian tumors including serous, mucinous, and adenocarcinoma Not Otherwise Specified (NOS). After grossing and processing, H and E sections were examined and representative 3–4 μm sections taken from blocks for immunohistochemistry which was performed with specific antibodies against ER, PR, and HER2/neu as per standard protocol. Statistical analysis was performed using Chi-square test. DISCUSSION AND RESULTS: ER expression was higher in malignant, borderline, serous tumors as compared to benign and mucinous tumors. PR expression was higher in borderline, serous tumors as compared to malignant and mucinous tumors. HER2/neu positive cases were higher in malignant, serous as compared to borderline and mucinous tumors. CONCLUSIONS: ER expression was found to be positive in most of serous tumors, have variable role in prognosis. PR expression showed protective role in survival of patients. Her2/neu was found to be expressed in higher grade and associated with poor prognosis. Together expression of ER and Her2/neu associated with decreased survival rates. OBJECTIVE: Folate and Vitamin B12 (B12) are crucial for normal growth, development, and cellular functions. The aim of this study was to determine the effect of required and excess folic acid (FA) concentration and imbalance of FA and B12 caused due to folate fortification on hepatocytes health and function in vitro. MATERIALS AND METHODS: Human hepatocellular carcinoma (HepG2) cells were cultured in FA and B12 deficient media for 15 days and further were supplemented with required FA: (6 μM) and excess FA: (60 μM) individually and in combination with B12: (500 nM). We assessed HepG2 proliferation, viability, tumor necrosis factor-alpha (TNFα) and methylenetetrahydrofolate reductase (MTHFR) mRNA expression, homocysteine, and malondialdehyde levels. RESULTS: Supplementation of B12 with FA increased proliferation as compared to only FA supplemented group. FA and B12 deficient cells and excess FA supplementation resulted in decreased viability. Supplementation of B12 at both FA concentrations increased (P < 0.05) cell viability. In the presence of B12 oxidative stress, TNFα mRNA and TNFα levels in cell lysate significantly decreased (P < 0.05) in both FA supplemented cells as compared to excess FA cells. Homocysteine levels significantly decreased (P < 0.05) in cells supplemented with normal FA + B12 as compared to excess FA supplemented cells and FA and B12 deficient cells. Supplementation of excess FA significantly downregulated (P < 0.05) MTHFR mRNA levels as compared to required FA cells. Combination of FA + B12 significantly upregulated (P < 0.01) MTHFR mRNA levels as compared to excess FA. CONCLUSION: These results accord the promoting effect of B12 with FA in developing nations like India where B12 deficiency is common while the concentration of folate is adequate. Acquired epileptic aphasia, otherwise known as Landau–Kleffner syndrome, is a childhood epilepsy syndrome, characterized by acquired aphasia, seizures, behavioral abnormalities, and abnormal electroencephalography (EEG), in various combinations. Sometimes, some intracranial pathologies, such as brain tumor, head injury, demyelination, and neurocysticercosis, have been found in association. Here, we report a case of a 5-year-old male child presenting with gradual loss of speech, behavioral abnormalities, such as hyperactivity, inattentiveness, and abnormal EEG findings, but without the classical seizures seen with this syndrome. INTRODUCTION: Cancer is most fatal disease, and the caregivers taking care of the cancer patients have a vital role to play in their health-care wellness. As chemotherapy is one of the treatments for cancer, the side effects of chemotherapy are very important to be manage at home by the caregivers. The most effective way of giving information to the caregivers was by giving a planned teaching programme (PTP) and enhancing their knowledge regarding home management and its side effects of chemotherapy. OBJECTIVES: The objective of this study was to assess the knowledge of caregivers of patients receiving chemotherapy; to administer PTP on home management and its side effects in terms of knowledge among caregivers of patients receiving chemotherapy; and to evaluate the effectiveness of PTP on home management and its side effects in terms of knowledge among caregivers of patients receiving chemotherapy. MATERIALS AND METHODS: A preexperimental research was conducted on sixty caregivers of patients receiving chemotherapy. 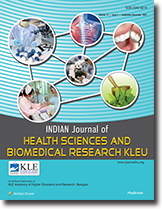 The study was conducted at KLE'S Belgaum Cancer Hospital, Belagavi, using one group pretest and posttest design. The demographic variables analyzed for the study were age, gender, religion, education, and income. The study was conducted using purposive sampling technique on a sample of 60 caregivers by knowledge-structured questionnaire to collect the data regarding home management and its side effects in terms of knowledge among caregivers of patients receiving chemotherapy. RESULTS: The pre- and post-test frequency and percentage of knowledge scores of respondents regarding home management and its side effects in terms of knowledge among caregivers of patients receiving chemotherapy revealed that pretest (13.34%) subjects had poor knowledge, 75% had average knowledge, and 11.66% had good knowledge scores, where posttest (6.67%) subjects had poor knowledge, 65% had average knowledge, and 28.33% had good knowledge scores. The effectiveness of PTP was assessed with paired t-test and it was revealed that there was a significant gain in knowledge at 0.05 level of significance. CONCLUSION: The study concluded that PTP was as effective teaching strategy to improve the knowledge regarding home management and its side effects in terms of knowledge among caregivers of patients receiving chemotherapy. OBJECTIVE: Brachial plexus block is a viable alternative to general anaesthesia as it provides adequate muscle relaxation,excellent intraoperative and post operative analgesia. Dexamethasone ,a synthetic glucocorticoid was combined with local anaesthetics to study the effects . This study was conducted to compare the onset and duration of sensory and motor block following administration of either bupivacaine and bupivacaine- Dexamethasone in patients undergoing upper limb surgeries under USG guided supraclavicular block. MATERIALS AND METHODS: 60 ASA I / II patients between of 18 and 60 years who underwent elective upper limb surgeries randomly allocated into two groups of 30 each by a sealed envelope technique to receive 30 ml of 0.5% Bupivacaine and 2 ml of normal saline in Group BS and 30 ml of 0.5% Bupivacaine with 2ml (8mg) of Dexamethasone in Group BD. The onset duration of sensory and motor blockade were observed between the two groups. RESULTS: The onset of sensory and motor blockade was faster in Group BD when compared to Group BS (p<0.0001). The duration of sensory and motor blockade was longer in Group BD when compared to Group BS (p<0.0001). There were no significant haemodynamic changes in the study group. CONCLUSION: Dexamethasone when added to Bupivacaine in supraclavicular block shortens the onset time and prolongs the duration of sensory and motor blockade without any systemic side effects. BACKGROUND AND OBJECTIVE: Exercise is inevitable to keep good health status, advised for health promotion, diagnosis of diseases, and rehabilitation. Different types of exercise are performed as exercise tolerance, but tolerance is not same for every individual. Thus, the objective of this study is to evaluate the cardiovascular responses for three different intensities of exercise using treadmill and bicycle ergometer at fixed heart rate (HR) value in young healthy adults. METHODS: After obtaining the ethical clearance from the Institutional Ethical Committee, a total of 130 participants were screened and 48 randomly selected male and female individuals with age group of 18–24 years and with normal body mass index. Selected participants are divided into three groups according to HR using WHO classification and Karvonen formula of exercise intensity. Sixteen individuals in each group start exercising for treadmill exercise at 3, 6, and 7.5 k/h, respectively, with zero inclination and for ergometer bicycle exercise at pedal frequency 50–60, 70–80, and 90–100 rpm, respectively, with 0 kg breaking resistance until calculated target HR is achieved. Cardiovascular parameters such as (systolic blood pressure [SBP], diastolic blood pressure [DBP], and rate pressure product [RPP]) pre- and post-exercise were recorded, and data are subjected to statistical analysis in both modes of exercise. RESULTS: SBP and RPP are linearly increased with increasing intensity of exercise and more observed in ergometer bicycling than treadmill exercise. Postexercise mean DBP among the three intensities of exercise: in mild exercise, there was negligible change in case of treadmill exercise and a higher mean DBP was recorded in case of ergometer bicycle exercise; in moderate exercise, value was slightly lower in treadmill exercise and slightly higher in ergometer bicycle exercise, but in severe exercise, mean DBP decreased in both treadmill as well as in ergometer bicycle exercise. CONCLUSION: Each mode of exercise has its own advantage and disadvantage depends on individual's physical condition and requirement. KarpuraGhrita has shown analgesic effect. Both the drugs have shown significant effect in post haemorrhoidectomy pain management. BACKGROUND: Computer vision syndrome (CVS) is a group of symptoms which crop up from the extended viewing of the visual display terminals, when the demands of the task exceed the abilities of the viewer. The symptoms of CVS include eyestrain, dry eyes, burning sensation, headache, focusing difficulties, and neck and shoulder pain. AIM: This study aims to evaluate the efficacy of Triphaladi compound and Shunthyadi eye drops in the management of CVS. MATERIALS AND METHODS: In this trial, forty patients were registered, of which 37 completed the treatment. In Group A, 18 patients had been prescribed Triphaladi compound internally and Shunthyadi eye drops, and in Group B, 19 patients had been prescribed the carboxymethylcellulose eye drops along with ergonomics adopted in both the groups. Assessment was done on the basis of eyestrain, redness, headache, blurring of vision, burning sensation, slow refocusing, irritation, fatigue, tear film breakup time, and Schirmer's I- test. RESULTS: In total, marked improvement was observed in 61% and 53% of patients in Group A and Group B, respectively. CONCLUSION: The study shows that Triphaladi compound and Shunthyadi eye drops provide better relief in breaking down the pathology of CVS topically and systematically. Behcet's disease (BD) is a multisystem inflammatory disorder with various neurological manifestations common in the Middle-East countries but scarcely reported in the Indian literature. We report three patients of neuro-BD with different neurological manifestations. Two cases presented as cerebral venous sinus thrombosis and the third case as pachymeningitis. It should be included in the differential diagnosis of any neurological disorder with a diagnostic dilemma as it is potentially treatable condition. INTRODUCTION: Over a decade, a large number of selective cyclooxygenase-2 (COX-2) inhibitors with diverse chemical characteristics have been designed but only a few have emerged as drugs. MATERIALS AND METHODS: In the present study, two-dimensional-quantitative structure-activity relationship (2D-QSAR) studies were performed on a set of 43 novel derivatives of diaryl furanone using V-Life Molecular Design Suite (MDS 3.5) QSAR plus module using multiple linear regression (MLR) and Partial Least Square (PLS) regression methods against a COX-2 enzyme. RESULTS AND DISCUSSION: PLS method has displayed a very significant prediction results. QSAR model was generated by a training set of 33 molecules with correlation coefficient (r2) of 0.7695, cross-validated correlation coefficient (q2) of 0.5359 and F test of 23.3734. The estate contribution, chi, hydrophobic, and alignment-independent descriptors were major contributors. CONCLUSION: 2D-QSAR model result showed the positive contribution of oxygen atoms and negative contribution of rotatable bonds and distance between double bonds toward biological activity. Angiolymphoid hyperplasia with eosinophilia is a benign condition which presents as vascular nodules or plaques, which are often multiple and grouped, located in the head and neck region, especially around the ears. It is associated with arteriovenous shunts in many cases, and they may be painful, pruritic, or pulsatile. On histology, it is characterized by proliferation of blood vessels with epithelioid cells surrounding the larger vessels and accompanied by eosinophils. Various treatment modalities have been described. Here, we present the case of a 30-year-old female with angiomatous nodules over the left ear,which were successfully treated. AIM AND OBJECTIVE: The aim of this study is to evaluate the rate of tooth movement caused by laser during individual canine retraction in the maxillary arch. MATERIALS AND METHODS: The study was done on 10 patients requiring upper first premolar extraction on both the sides and individual canine retraction using closed NiTi coil spring with high anchorage. A split-mouth technique was carried out where the right quadrant was the experimental side and left quadrant was the control side. On experimental side, canine was irradiated with Ga-As semiconductor laser (wavelength – 940 nm, output – 0.2 mW for 25 s, energy density – 5 J/cm2). Amount of retraction was measured using digital caliper on the cast. A palatal plug was used as a reference to ascertain retraction of canine. RESULTS: Results showed statistically significant difference in tooth movement on the experimental sides compared to control side. CONCLUSION: Hence, it can be concluded that laser effectively accelerates the tooth movement and reduce the treatment duration in clinical practice.